With our ATP picks in the books, it’s time to turn our attention to the ladies’ event. In a field led by top seed Serena Williams, is there anyone who can upset the status quo? Or will Williams do some script-flipping of her own in capturing her first Australian Open trophy since 2010? Check out the crew’s full picks compiled into an easy-to-follow grid at the bottom. 1. The Biggest Dark Horse? Most people are looking to unseeded Victoria Azarenka to do some damage this year, and she can certainly down long-time friend Caroline Wozniacki in the second round after the Dane picked up a minor wrist injury in her opening match at Sydney following a final in Auckland a week prior. Wozniacki’s conqueror there was Venus Williams, and she’s the woman I predict as the dark horse for the top half this year. Though she may be seeded 18th, Williams hasn’t progressed past the fourth round of a slam since 2010. But her title in Auckland showed she can still maintain pace with the young guns. She has a favorable early draw, with potential matches against Petra Kvitova or Agnieszka Radwanska in sight. I can’t believe I’m going to say this, but Barbora Zahlavova Strycova finds herself in a fascinating segment of the draw. In the third round, she would go up against whoever emerges from a chaotic cluster of Azarenka, Wozniacki, and Americans Sloane Stephens and Taylor Townsend. For those four players, that’s already a tough first two rounds, and they could find themselves tired going into round three with against a BZS who has been peaking of late. I wouldn’t be shocked if she pulled off a win and moved on deeper into the draw. Karolina Pliskova made the finals of five WTA events in 2014, claiming titles in Seoul and Linz. Her 2015 has already begun with a bang with highlights including a win over Azarenka in Brisbane and an appearance in another final in Sydney. Her draw is one where it wouldn’t shock anyone to see her get through to the fourth round, where she would most likely face No. 5 seed Ana Ivanovic, or the quarterfinals, where she would most likely face No. 3 Simona Halep. Pliskova can hit with the best of them, so keep an eye out for her in Melbourne. I picked a hometown favorite to make waves in the men’s draw, and I’m inclined to do the same here. Daria Gavrilova looked to have all the goods when she graduated from juniors in 2010, winning the Youth Olympic Gold medal and the US Open girl’s trophy. A protracted stay in the woods of obscurity saw her reemerge stronger than ever in 2013, when she took out soon-to-be Rising Star Eugenie Bouchard en route to her first major main draw victory. A torn ACL stunted her progress, but the now-Australian Gavrilova is quickly making up for lost time, winning the Australian Open Wildcard Play-off in December and pushing Angelique Kerber twice in two weeks. The second match in Sydney went well into the night and left the German stunned by her wild aggression. Both Bouchard and Kerber are in her section, and if she catches fire from the start, watch out. In the past, the WTA has been characterized – for better or for worse – by its unpredictability. The depth on the women’s tour is immense, and even the top seeds themselves have stated that this tournament is up for grabs. Karolina Pliskova, who made a great run to the final in Sydney last week could be an outside pick to go deep this fortnight, so too could Svetlana Kuznetsova, who has enjoyed success here over the years. But her success here pales in comparison to that of Victoria Azarenka, who just missed the seedings, and is without a doubt the biggest dark horse on the women’s side. She’s motivated to get back to the top, and the courts here suit here aggressive baseline game. Australians might not warm to her on court, but she loves the heat of the courts Down Under, and will be one to watch despite a difficult draw. Belinda Bencic. At 17, Bencic has every tool in her repertoire to take down Top 10 players. A junior phenom, last year marked her main draw debuts at the Grand Slam tournaments. At the US Open she fought her way to the quarterfinals, scoring wins over Kurumi Nara, the No. 31 seed, No. 6 seed Angelique Kerber seeded No. 6, and No. 9 Jelena Jankovic. She is coached by Melanie Molitor, Martina Hingis’s mother and former coach. Bencic’s court sense is positively Hingisesque, the youngest slam champion of all time. Her style is also similar to Hingis, but critically more powerful and aggressive. Seeded for the first time at a major tournament, her quarter includes heavy-weights Ana Ivanovic and Simona Halep. We’ll see if the teen’s momentum can continue over the next two weeks. Is Karolina Pliskova still a dark horse? Probably not. Azarenka has been lumped into the first quarter of death right next to Wozniacki, and Madison Keys could run into Kvitova as early as the third round. I’m going to go left field and pick Jarmila Gajdosova to fly the Aussie flag into the second week. Azarenka? Too accomplished. Pliskova? Too mainstream. My sleeper pick? As someone who’s been high on the Serb’s potential since I first witnessed her Fed Cup heroics in 2011, it was incredibly fulfilling to witness her giant-killing US Open run in person. She’s landed in an interesting section of the draw – she opens against Lauren Davis and a second round match against Venus Williams could be on the cards. Don’t expect Krunic to be daunted by the prospect of facing off against the elder Williams, and I’d be on board to see her match wits with Agnieszka Radwanska in the fourth round. To reiterate my opening predictions, I expect a possible second round clash between Azarenka and No. 8 seed Caroline Wozniacki to ensue Down Under. Each have polar opposite styles, and we could be in for a treat à la Radwanska vs. Azarenka Australian Open 2014, with the Dane’s supreme retrieving vs. the Belorussian’s precision power striking. Azarenka is out to prove doubters wrong in 2015, and may be feeling extra incentive to pull off the upset. Except for Caroline Wozniacki, all the Top 8 have fairly kind draws, at least through to the third round. As I’ve already mentioned, Wozniacki has to face first Townsend, then Azarenka or Stephens, and then potentially Zahlavova-Strycova. That’s an incredibly tough draw. I don’t know if “tired” is really a thing you have to worry about with Wozniacki, but there’s every opportunity for an opponent to peak against her at the opening of the tournament. Caroline Wozniacki. The US Open runner-up faces Taylor Townsend in the first round and the winner of Sloane Stephens and Victoria Azarenka in the second round. That is an absolutely brutal first two rounds for a Top 8 seed. Agnieszka Radwanska has the shots to light up many a highlight reel, but stringing together seven matches hasn’t been her specialty. Since looking like a lock to reach her second Grand Slam final in Melbourne a year ago, the Pole has bottomed out to three big-hitters in the last three major tournaments. Look for her to make substantial improvements with new coach Martina Navratilova by spring, but even that will likely require Radwanska to lose a few matches the right way in order to stop winning the wrong way. It’s true that Eugenie Bouchard has a lot to defend at this major – though she denies approaching it with such a mentality – and was generally unconvincing at the Hopman Cup. With Kuznetsova is a possible third round opponent, replicating last year’s result will be tough – but not impossible – given the Canadian’s propensity to shine on the big stages. Given this, I have to stick with my guns: with Azarenka unseeded (and looming) in the second round, it’s quite possible that Caroline Wozniacki, despite being an outside favorite for the title given her late-2014 regenesis, might make an early exit this year – especially if the wrist injury she picked up remains a concern. Dominika Cibulkova made an astonishing run to the final last year, losing to Li Na. The Slovakian is a power house, runs like the wind, and can grind points until an opponent just gives up. Since her result last year, though, her road has been bumpy. She won Acapulco in February, lost in the quarters at Indian Wells, and the semis in Miami to Li Na. From that point forward, her best finish was the quarters in Tokyo. She didn’t make it to the second week at Roland Garros or Wimbledon and crashed out of the U. S. Open in the first round. In 11 other tournaments, she lost in the first round seven times. Kristen Flipkens, her first opponent, may not present the problems she once demonstrated. But in Cibulkova’s quarter, the nastiest of the entire draw, await worrisome competitors: Serena Williams and Alizé Cornet, to name two. The petite Cibulkova will have to muster a champion’s mindset immediately, if she plans to see week two and have any shot at defending her points. The chances of this are slim. There are arguments to be made for all of Halep, Kvitova, Radwanska and Wozniacki going out in the first three rounds. Radwanska could run into nemesis Varvara Lepchenko early, Kvitova might have her hands full with Keys, much like Halep if Gajdosova and Sabine Lisicki come to play. But Wozniacki is in most peril in my opinion, having Townsend, maybe Azarenka and Zahlavova-Strycova close by – particularly if her wrist still bothers her. This is the event where Bouchard comes full circle. The Canadian announced herself on the WTA Tour in Melbourne one year ago, and it’s the first in a long line of results she’s defending this year. I expect the winner of the first round clash between Svetlana Kuznetsova and Caroline Garcia to be the Canadian’s third round opponent, and both the Russian and Frenchwoman certainly posses enough firepower to overwhelm her. Surprisingly, the World No. 1 Serena Williams seems to have the most difficult draw between the Top 4 seeds. Though I don’t expect her to fall to the likes of Vera Zvonareva – who’s currently on a comeback trail – and I expect the four-time champion to be ruthless in handling rising stars like Jana Cepelova and the in-form Elina Svitolina. I do think she’ll run into trouble with a possible meeting against Jelena Jankovic in the fourth round. There’s also her 2014 nemesis, Alizé Cornet, waiting in the shadows should the Frenchwoman navigate her way past firecracker Dominika Cibulkova. And then there’s a potential quarterfinal against Wozniacki (or Azarenka) to contend with, and a shootout semifinal against either Kvitova or Radwanka, who beat her for the first time at Hopman Cup. Serena Williams has the opponents that most trouble her lingering in her quarter. Muguruza, who knocked her out of the French Open last year, is there. Cornet, who defeated Williams on more than one occasion including at Wimbledon, is also around. Jankovic, who enjoys playing with Williams’s mind, is also a potential fourth round competitor. Good friend Caroline Wozniacki could be her quarter final opponent if the Dane can survive her own tough draw. And then, if things go according to seed, she would face Petra Kvitova in the semifinal. That is not easy, at all. Serena‘s final five matches could look like this: Elina Svitolina, Garbine Muguruza or Jelena Jankovic, Caroline Wozniacki, Petra Kvitova, Maria Sharapova. That’s about as hard as it gets, even for an 18-time Grand Slam champion. Maria Sharapova will have plenty of chances to play her way into form through the first couple rounds, but by the time the second week begins, all bets are off for the Brisbane champ. Kicking things off for Sharapova is No. 16 seed Lucie Safarova, who has drawn the Russian into three-set epics in their last three encounters. Should she get past the Czech star, she would likely play either No. 7 Bouchard or No. 9 Kerber, both players who gave the reigning French Open champion fits at majors last year. Though she’s never lost to Halep, the Romanian looked close to toppling Sharapova multiple times in 2014, and they’re drawn to face in the semifinals. And do I even have to mention top seeded Serena? With the exception of the loaded slice of the draw – including Azarenka, Sloane Stephens and Wozniacki – the early draws are balanced for the Top 4 seeds. Among them however, Serena appears to have the greatest threats – including those aforementioned three who each have registered wins over the World No. 1. Given Serena’s general lack of form and the ominous presence of conquerors past in her draw (Bonjour, Alizé Cornet), her route to the final is far from straightforward. All the familiar faces that caused her heartache and sleepless nights at slams last year are bunched in the top quarter and top half for Serena. There’s Garbiñe Muguruza, who defeated Serena in the second round of Roland Garros. Alizé Cornet, who served up a win of Williams in the 3rd round of Wimbledon lurks. And her buddy Caroline Wozniacki is the projected quarterfinal opponent. Wozniacki’s loss to Serena in New York last year was close. Can’t imagine the Dane will stand for much more. But we all know, like deep in our hearts and on paper, that Serena can pull rabbits out of her hat when she is motivated. Can she win her 19th major? Not with this draw. It’s a toss up between Williams and Halep but I’ll got with the Romanian, simply for the sheer amount of dangerous, if unreliable big hitters that she could meet on her way to the semis alone. There are a few banana peels on Kvitova’s way, too – make no mistake. She may be playing well, but for Ana Ivanovic, her toughest opponent since winning the 2008 French Open has been herself. In a quarter with players who could outhit her (Makarova, Pliskova) or could outfox her (Halep), Ivanovic may be feeling the pressure at her highest seed at a Slam in six years. She could hit a new gear at her favorite major tournament, but it’ll be a tough road. 4. The Most Exciting 1R? Who could deny Sloane Stephens vs. Victoria Azarenka a Rod Laver backdrop for their opening round match? This has the potential to be a blowout or a grueling test for either woman. Will there still be some bad blood following last year’s kerfuffle in the fourth round of the Australian Open? It was episode that saw Stephens accidentally aim a ball at Azarenka’s pelvic region whilst retrieving a drop shot at the net. And let’s not forget what happened when they met here in 2013. Sloane Stephens vs Victoria Azarenka, without a doubt. The two have history at the Australian Open, with Azarenka having caused controversy with her win over the young Americans in the fourth round last year after what seemed like a misunderstanding during an on-court interview. Azarenka doesn’t look fully fit yet, and Stephens hasn’t played good tennis in quite some time. That one could be dramatic, messy, wonderful. So WTA. Stephens/Azarenka. This match has about 100 different story lines. For one, it’s a rematch of their drama filled 2013 semifinal, which is now mainly remembered for the eventual champion’s controversial medical timeout. It’s also, in many ways, a platform for two struggling players to prove themselves. Azarenka’s 2014 was marginalized by a foot injury while Stephens’s was simply hampered by her own poor play. The winner of this match will have recorded a confidence boosting victory and the loser will have many questions to ask of themselves moving forward. I have to go with No. 11 seed Dominika Cibulkova vs. Kirsten Flipkens. Neither had ideal seasons last year (taking Cibulkova’s Australian Open final off the table); Flipkens was seeded No. 18 here last year and a string of middling results left her just within the world’s Top 50. All eyes will be on Cibulkova, who has struggled with anyone and everyone since failing to capture the title in Kuala Lumpur last spring. An early loss here would well be the nadir of her last 52 weeks, but feeling like the underdog may leave her with little left to lose, and help her unlock her best tennis. While I’m tempted to pick Varvara Lepchenko vs. Vitalia Diatchenko because they share 11 of the same letters in their name, Azarenka vs. Stephens has to be the most compelling. Not only is it a rematch of their “controversial” semifinal from two years ago, but the implications it has for other big names in that first quarter is immense. Will Azarenka triumph and slash her way through the rest of her quarter? Or will Stephens have something different to say about Azarenka’s status as premier darkhorse? No doubt about it: Victoria Azarenka and Sloane Stephens. The term, “luck of the draw” takes on all sorts of contorted perspectives for this shocker of a start to the first Grand Slam of the year. Both seeded in 2014 — Azarenka at No. 2 — this is a clash of dangerous floaters maxed out on triple espressos. Yet, Azarenka should pull it off. She’s motivated, healthy, and not happy about her ranking. On the other hand, Stephens is a question mark, as per usual. The talented American has most of us miffed when it comes to her perceived commitment to the game. Don’t look for her to pull off a surprise win, as her ranking continues to fall. So many. I feel as though I might need an extra pair of eyes and screens – but you cannot argue against Azarenka-Stephens. A cruel twist of fortune for two players who’ve got so much to prove and so much on the line at this tournament. One of them will have to pick up a lot of pieces after the Australian Open. As I did for the men, I’m going off the grid and picking an all-unseeded clash: Heather Watson vs. Tsvetana Pironkova. Much like my ATP choice of Troicki vs. Vesely, these two are coming off strong weeks in Hobart and Sydney, respectively. Watson claimed her second career title in Tasmania, while Pironkova did an admirable job in her title defense; after being denied a wildcard, the Bulgarian reached the semifinals. Oddly enough, the two have met four times before – but the head-to-head hasn’t unfolded as you’d expect. Watson’s two wins came on grass, while Pironkova’s two wins came on hard court. 5. The 1R Upset Alert? While it wouldn’t be too much of a shock, even if we take into consideration that she was last year’s finalist, I could potentially see Dominika Cibulkova lose at the hands of Kirsten Flipkens in their first round encounter. The pair have divided their four career meetings two a piece, and have split two victories on hard courts. It’s definitely one scoreline to watch in week one. Cibulkova vs. Flipkens should be a major red flag match. Cibulkova has finalist points to defend at this tournament, and I don’t think anyone in the tennis world really thinks she’s going to manage to replicate the success of last year’s campaign. Flipkens is never an easy opponent, and can be really great if she’s having a good day. If you’re Cibulkova, and you’re understandably nervous, that’s not necessarily the first round draw you would have asked for. With both Stephens and Azarenka both unseeded, we all knew the potential for them to draw tough first round opponents or, as we have it now, each other. One of them will be sent home packing very early and if I had to guess, it’s probably going to be Stephens. I’ll go with the opening round encounter between Timea Bacsinszky and No. 15 seed Jelena Jankovic. The Serb has been far below her best in the past few months where the Swiss has been one of the fastest risers since her comeback began in earnest a year ago. Bacsinszky has enough aggression to outfox JJ, and could potentially spin this into a run to the second week. For Jankovic, it would be an undoubtedly disappointing loss, but she hasn’t looked like the same player who went toe-to-toe with Serena and bageled Sharapova in a long time. For the most part, big names on the women’s side were able to avoid noteworthy opponents in their first rounds. If anyone could crash and burn, however, it might be Ana Ivanovic who, despite good form in Brisbane, has drawn a massive hitter in Lucie Hradecka. The Czech was a major thorn in the Serb’s side back at Wimbledon in 2009, where she push her to an 8-6 final set in their only other encounter. If the Czech can find range on her massive serve and groundstrokes as compatriot Karolina Pliskova did at the last major, Ivanovic might be in danger of another disappointing major exit. If Sloane Stephens loses first, which isn’t improbable, her motives will again be examined as they are everywhere she plays. Stephens doesn’t like to be pushed when asked about her results, why she looks so forlorn on court at times, and her indifference to rankings. “I don’t care if my ranking drops to 800,” she told reporters in a WTA All-access Hour at Family Circle Cup last year. It could become much more uncomfortable, too. It has to be Jelena Jankovic. The Serb struggled with back issues during the off-season and didn’t look great while losing to Ajla Tomljanovic in Brisbane. In her first round match she’s drawn dangerous Swiss Timea Bacsinszky. There’s a realistic chance that the glitter will be floating down the Yarra River into the open sea very very early. I’ve got a weird feeling that Irina-Camelia Begu will take out Angelique Kerber. The Romanian might’ve dropped her first two matches of the year from a set up, but she’s a player who could’ve snuck in the seedings in Melbourne with one more strong result. Currently ranked No. 39, Begu is best known for taking out Wozniacki in the first round of the 2012 US Open. On the other side of the net, Kerber never really looked convincing in either Brisbane or Sydney, despite making deep runs. It’s often between the ears for the Romanian No. 2, and should she keep the match close, the arrival of “Duncurrber” could only build her confidence. Azarenka/Kvitova, Halep/Sharapova. The top half will either see Serena dominate in stark contrast to her Hopman Cup defeats, or see a shock defeat in the early stages – yet again – should she fail to catch fire. All potential drama aside, my semifinalists in the top half will be Victoria Azarenka vs. Petra Kvitova. We’ll finally get the match we’ve been waiting for since 2011. In the bottom half I can see Simona Halep surprisingly rout Ana Ivanovic to set up a semifinal against her 2014 arch-nemesis, Maria Sharapova. Williams/Williams, Ivanovic/Sharapova. Venus Williams has looked really good at the start of 2015, and looking at her draw, I think she has a real opportunity at the Australian Open. She shares a quarter with Kvitova and Radwanska, both of whom have potential to suffer shock defeats this week, or at the hands of Venus herself. Serena, meanwhile, has a ton of grudge matches lined up in her quarter – I think she’ll relish her draw. Ivanovic and Sharapova have looked consistently good for a number of months, and gave yet another entertaining match in the final of Brisbane just two weeks ago. I can’t really see Bouchard getting the better of Sharapova in their seeded quarter-final, and I’m not even sure Halep will reach the quarter-final stage to take on Ivanovic, considering her health is currently a big question. Williams/Williams, Halep/Sharapova. I’ll go with Serena in the first quarter. She has had her fair share of disappointments Down Under for the past few years, but I think she turns things around and gets through to a semifinal against her sister. The elder Williams is surely itching to play Petra Kvitova in yet another big time Grand Slam match as they did at Wimbledon last year. A quarterfinal matchup between these two would be one to look forward to and one that Venus could definitely get through. Halep being sick the week before a slam isn’t the best news for her and her supporters, but I just don’t see anyone in her quarter of the draw taking her out on such a big stage. Finally, Sharapova has to be liking her draw. She’ll feel confident in her chances to make the semifinals, even if she does come up against Angelique Kerber or Eugenie Bouchard in the quarterfinals. Nothing against those two, but Sharapova’s form would have her as a decisive favorite over either of her likely quarterfinal opponents. Williams/Kvitova, Halep/Sharapova. Where have all the upsets gone? Something about picking the Top 4 to all reach the semifinals of a WTA major tournament seems wrong. Where’s the chaos? Where are the upsets? Oh, we’ll have them, but I do believe a sense of stability will overtake the tournament by the middle of the second week. Going through the draw, I tried to hazard a guess as to which of these semifinalists were most likely to crash out. Kvitova was immediately earmarked, but she doesn’t really have the right floater to take her out too early. Williams was another obvious pick given how she played Hopman Cup. But it was, shocking as it was, Hopman Cup. Moving down to the bottom half and Halep and Sharapova were impressive in their warm-up events. Halep showed none of the doubt that could have haunted a player with a new coaching team, while Sharapova showed none of the form that haunted her through much of last year’s hard court tournaments. Guess we’ll have to be entertained by…good tennis? Weird. Azarenka vs. V. Williams, Halep vs. Sharapova. So many of my picks rely heavily on Azarenka as a dark horse. If she can get past Wozniacki – and there’s absolutely a chance she won’t – her chances are that much greater. Serena’s form and apparent lack of enthusiasm about said form has me wondering how much she’ll bring to this major. Venus’ form, by contrast, has been magnificent and this might be one of her last chances (though isn’t it always?) to make a deep run at a major, courtesy of a winnable draw. Halep also has a manageable draw and looked strong in her last 10 sets in Shenzen, while Sharapova’s form seems to finally match her fight. If both make it to the semis, we could be in for another classic. Wozniacki/Kvitova, Ivanovic/Sharapova. With Wozniacki finally filling her Sunshine shoes in the early rounds, she’ll present a formidable foe for two-time Wimbledon Champion and just-crowned Sydney champion in the semifinals. Kvitova demolished Wozniacki at Wimbledon in 2010, surprisingly their only meeting at a slam. Both have grown their games since. Both have gotten more fit, an essential element since they dream big. Both are 24. There is really no one in Kvitova’s draw that could stop her reaching the semifinals, except perhaps Venus Williams. Both Ivanovic and Sharapova are on rolls. They strike the ball similarly, and have enough fight between them to ignite any court. Their Brisbane final was a cracker, Sharapova winning in three. Ivanovic is seeded No. 5, as high as she’s been in years. She is relaxed and happy to be excelling. Most likely, though, she will have to defeat Simona Halep in the quarters. This is a tough ask, but one Ivanovic can pull off with the right plan, which she always seems to have on any court, during any match. Sharapova’s only real challenge should come from Eugenie Bouchard, the 2014 semifinalist. The Canadian, though, could very well have a let down this year, after such stellar results from her first year on tour. Williams/Kvitova, Pliskova/Sharapova. A rematch of two of the game’s best grass courters could be an entertaining one, certainly as fun as their 2012 Wimbledon encounter. I see Pliskova making good on the promise she’s shown early on, where she might match up well against the resurgent Russian. Muguruza/Kvitova, Halep/Sharapova. Most people refer to Garbiñe Muguruza’s run to the quarterfinals of Roland Garros – and 6-2, 6-2 upset of the top seed Williams – was certainly the talking point of her 2014, but her Grand Slam season began with a fourth round showing Down Under. She upset Wozniacki en route to that stage last year, and could be primed to be the third consecutive 21-and-under to make the final four. I think that she’ll have learned from that loss to Sharapova, and won’t be daunted should she come up against a revenge-minded Williams in the fourth round. From the second quarter, Kvitova might be due for a return trip to the semifinals: a stage in Australia she hasn’t featured at since she challenged for the No. 1 ranking in 2012. The “blockbuster” semifinal will come on the bottom half of the draw, as I expect the top two seeds to face off in what could be yet another classic encounter. This may come as to no surprise to many people who follow my tennis commentary, but I do predict No. 2 Maria Sharapova will claim her first odd-year and overall sixth grand slam title, in a scrappy three-set victory at the Australian Open. I know when her peak hits and when it troughs, and I believe she’ll navigate her pathway to the final with precision and less exertion than last year, however bold this statement may be. Of course I expect some slight bumps along the way – here’s looking at you Simona Halep. Her opponent in the final will be Petra Kvitova because, let’s face it, she isn’t defeating Serena anytime soon, and especially not in a major final. Because I believe in fairy tales, that’s why. I really like Sharapova‘s chances in this tournament. Her draw will provide her with an relatively easy path to the finals, while her kryptonite, Serena Williams, will have to face obstacle after obstacle. I’m not sure I trust Sharapova to beat Williams in a Grand Slam final even if Serena has a few chinks in her armor, but then I’m not so sure we’ll be seeing Serena in the final altogether. The WTA has always been with reality with a mix of fantastical whimsy, which is why Serena Williams will win her nineteenth Grand Slam title, and sixth Down Under. If we’ve learned anything from the top seed through her illustrious career, it’s this: never count her out. Sure, she had some hiccups last year, but a healthy and motivated Williams is undoubtedly poised to attack the 2015 season with – to borrow one of her words – aplomb. I’ll go even further against the grain of my colleagues and wager Sharapova will find herself stopped in the semis by none other than Simona Halep. The Russian has looked good, to be sure, but I’ve seen this movie before. It’s called the 2013 Australian Open, the one where she barreled through the opening five rounds – barely losing games – before finding herself thumped by a game opponent in the semifinals. The two matches Williams and Halep played in Singapore were hardly inspiring in isolation, but if they can somehow combine the two, we may be in for an early-season treat. Maria Sharapova. It’s so difficult to pick a champion in women’s tennis since, it feels like anything can happen at any time. But that’s what makes it fun. Sharapova is both in-form and in a half of the draw laden with players that she has beaten numerous times in the past few years. If Maria’s form deserts her, her fight certainly won’t, and there’s a chance she’ll be walking away with another major trophy – and maybe the No.1 ranking – in two week’s time. Sharapova wants Grand Slam titles. She has five, but six would make her that much happier. She has an edge this year, which makes her dangerous. Her ferocity is keener. Her ball striking cleaner. And her footwork is sharper. Whether she meets Wozniacki or Kvitova should make no difference. Where Nishikori was a pick based on gut feeling and off-season thoughts, Sharapova is very much a “head” pick based on the last 14 days. The Russian looked good in Brisbane and, taking everything into account, she has the least amount of banana peels on her way to the finals. I’m completely expecting all hell to break loose in the women’s draw, similarly to the last few Slams, and can see Sharapova gritting and grinding her way through the carnage to lift her sixth Grand Slam trophy – but not after a tooth and nail fight with Petra Kvitova in the finals, who’s looking the fittest she ever has in Australia. Petra Kvitova. Because, some time, somewhere, she’ll win not-Wimbledon. Who would you have chosen? Sound off in the comments! I dont see the big deal with Sloane-Vika apart from the “drama” factor. They already had rematch of their 2013 SF encounter last year in 4th round. Vika beat Sloane comprehensively there. One thing against Vika is her lack of match play. 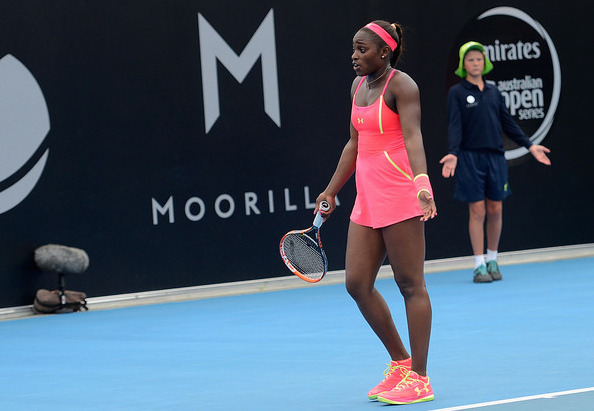 But she looked good in her match against KaP in Brisbane, and against a slightly weaker opponent could have won it. I think it will be a straight set win for Vika and another disappointing result for Sloane. She will probably fall out of top 50 after this. I was being too harsh. Sloane wont fall out of top 50. Prbbly somewhere late 30s-early 40s.